Bristol are likely to be without Gavin Henson for the first leg of the Championship play-off final with Doncaster Knights. The former Wales and British and Irish Lions star has not fully recovered from a calf problem and is unlikely to be risked on Wednesday, but could return for the second leg at Ashton Gate a week later. However, the big spenders have been boosted by the return of eight players to training this week, including Championship player of the year Jack Lam. 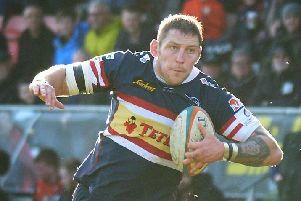 “We’re really pleased that a number of our injured players are back fit,” said Bristol’s director of rugby Andy Robinson. “Marco Mama is back, Will Cliff is back, Jack Tovey is back, Olly Robinson is back, Mitch Eadie is back in training, and Adrian Jarvis as well. “There’s a really good complement of players, which is making selection a really tough decision for us. We’ll announce the side on Tuesday. “You know the squad we’ve got, and you know we’ve used the squad, and I think it’s important that we’ve had to use that squad. I’ve been really pleased with the way each player has been able to step up. Bristol are hoping it is a case of third time lucky having lost in the last two Championship play-off finals, to London Welsh in 2014 and Worcester in 2015. This is the first time in Doncaster’s history that they have reached the showpiece final. Bristol have sold more than 13,200 tickets for the second leg on May 25.